Always here to help, feel free to email or call with any questions or concerns. BUY with Full confidence & "Peace Of Mind", if you're not 100% satisfied send it back for a Refund within 90 Days of purchase. ❤ What's in the Package - 1 World Globe. Dimension: Diameter: 8 inches. 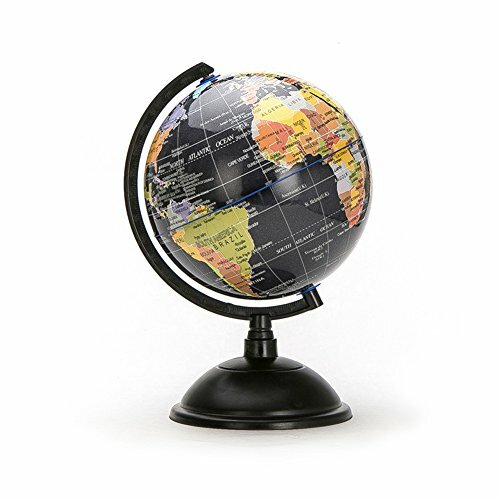 ❤ High-definition & 360°Rotatable - PVC HD colored printing texts, adopt the lastest territory, different colors indicate areas and bold mark equator line for quick and easy positioning. ❤ Rotatable and Wearproof - Thick plastic material, broken and abrasion resistant, rotating shafts connect with sphere tightly, easy to rotate yet anti-fall off. ❤ Perfect Gifts - Suitable gifts for children, take it as a tool of geography teaching, the lovely appearance can attract children to explore the world, also as a decoration in kid's room. ❤After-sales Service - For quality problem: 100% Refund within 90 days and Replacement within one year. Lifetime Guarantee Customer Service. If you have any questions about this product by HaloVa, contact us by completing and submitting the form below. If you are looking for a specif part number, please include it with your message.